The black rubber hose is the most common. It is the best fit for most of the flammable adhesives in the TensorGrip range. This hose has the greatest flexibility for ease of use. For TensorGrip non-flam adhesives we recommend the steel braided hose. Non-flam adhesives use different propellants to flammable adhesives, and some of these can seep out of a standard rubber hose. This leads to two things: 1) your canister loses pressure, and 2) the adhesive in the hose cures. To prevent this, the steel braided hose is recommended, as it has a higher density lining. Some TensorGrip adhesives cure when they are exposed to moisture. This includes polyurethane based adhesives. Standard hoses don’t have the density to prevent moisture from entering the hose, and adhesive in the hose can cure between uses. TensorGrip polyurethane adhesives like this MUST be used with our moisture block hose. When you’re looking at a new TensorGrip adhesive, it’s crucial you get the right hose. We conduct extensive testing to ensure the hose and gun combination is right for each adhesive. 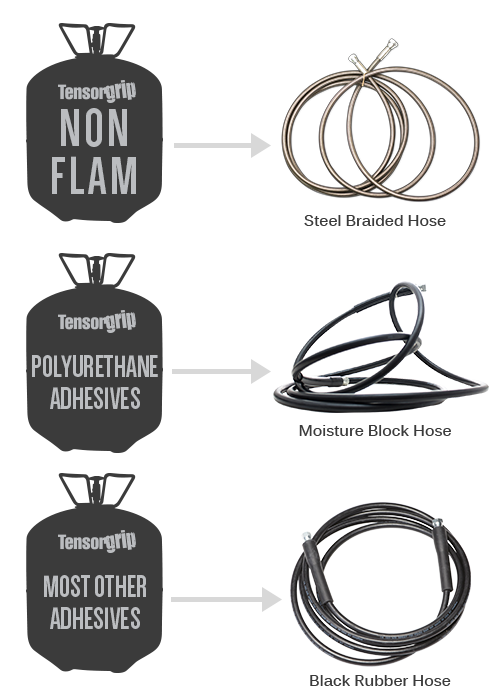 To check which hose your TensorGrip adhesive needs, click here. Remember to always ensure that the connection to both the canister and the spray gun are tightened firmly. Whilst they may appear to be flexible connections, they are not and must be tight to prevent leakage.